In the recent Field Museum exhibition â€˜Scenes from the Stone Age: The Cave Paintings of Lascaux,â€™ perfect replicas of a 20,000 year old archaeological site in the Southwestern countryside of France are brought to Chicago by way of 3D models, to-scale stone replicas and cast artifacts. The process by which the drawings and cave structures are being visualized shows a contemporary trend of using advanced imaging technologies to digitally represent and conserve the surfaces of objects and locates it purely within an aesthetic analysis of surface. The recent predominance of surface is seen most notably in cultural objects that come to us via the internet and hand-held mobile devices. 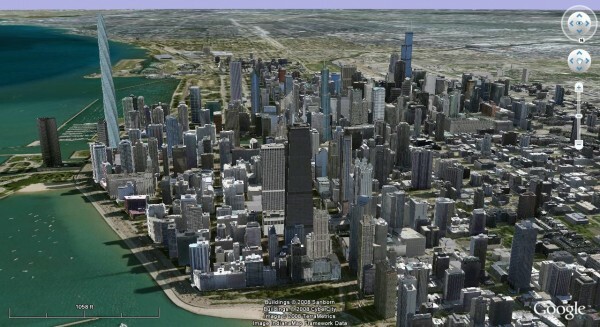 Google Earth is a leading proponent that is warming us to this way of being in the world. Ambitious in its scope, it seeks to map out by way of photographic image an accurate depiction of the entirety of the earth. It does this via satellite imagery and numerous on land instruments that take 8 simultaneous pictures and seam them together as a flowing surface. In this digital replicating of the world through image, one is able to traverse any place on earth through a screen. Spin-Cam, a recent application for the iPhone, allows viewers to download panoramic images of locations from around the world and view them, hands outstretched, through the surface of their screens at the same position they were taken. Literally spinning in place while a different location is grafted onto the present. A recent development in printing technologies, centralized to the advertizing industry, has allowed for images to be placed onto a mesh vinyl that is able to be seen though when near, but at a distance reveals an image. 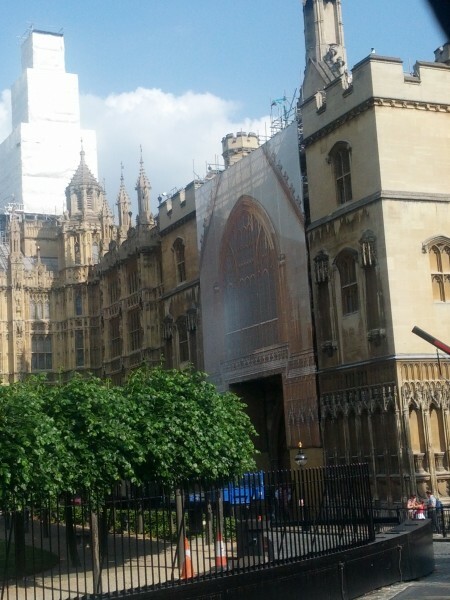 Used in construction sites during the restoration of important structures, it has been used to place an image of the building as it is planned to look on the outer scaffolding, or skin, to mask the potentially unflattering things being done to its exterior facade. In all of these instances, including the recent Field Museum exhibition, the surface of the experienced world is presented as disembodied and able to be understood as object. Lascaux, as the caves paintings have come to be called, was discovered in 1940 and made into a tourist attraction in 1948. Due to heavy carbon monoxide levels generated by roughly 1200 visitors per day, the caves were shut down to conserve them from damage. To satisfy the desire to see these ancient discoveries, in 1983 a nearby quarry was used to house a pair of to-scale replicas of walls from the original. It was given the name Lascaux II in recognition of its artifice. Constructed with armatures and concrete, detailed diagrams were made of the original paintings and reproduced by hand using pigments and tools similar to what may have been used by the creators of the original. The field museum presents another, mathematically precise, iteration of the replicated cave drawings. The entrance of the exhibition begins with a stone object that is worn, weathered and dimly lit. This initial confrontation with the stone object anchors the viewer in a familiarity to the real. Light slowly traces the contours of faint engravings on the fragment calling our attention to an abstracted horse hidden within the surface. The revealing of a hidden illusion on the surface of the stone sets the stage for a type of reversal between the real and the artificial that occurs throughout the exhibit. In an adjacent room, the mesmerizing sound of a synthesizer pulses soothing digital tones that feel like a sacred chant. Six stark-white, bulbous vessels recall decayed and hollowed out tree trunks resting on skewed geometric bases. At waist height, these objects refer to horizontal bodies balancing precariously on the peaks of mountains. Sleek, bendable lights are perched at the entrance to each of these forms illuminating the interior surface. The hollow vessels are so thin that the interior and exterior skins appear to be the same. A realistic digital animation projected onto the wall is the heart of the exhibition. It connects the forms surrounding the viewer into a single entity that slowly rotates amidst a black background. It looks like an organic spaceship, floating with no reference to its own scale. As the animation rotates the cave structure, the viewer becomes aware that the exterior surface is derived purely from images of its interior. The cave as 3D model is a pure flowing surface. This visualization of the cave structure as an absolute object is an experience that would be impossible to attain in real life. The camera enters into the digital cave structure and moves with anthropomorphic gestures through the detailed interior, bobbing ever so slightly to the left and right as if to mimic how we walk through the world. Artificial bats rush through the caves and floating balls of fire illuminate the chambers casting faux shadows on the walls. At the end of the tunnel is a bright light that obscures any further view. This visualization of the caves interior is key to understanding the objects in the room. The white vessels in the space become blank sheets of paper that the viewer can now graft the cave drawings onto. It is impossible to resist imagining oneself inside the vessels at a 1:10 scale. Surface and replication are emphasized by the exhibition. 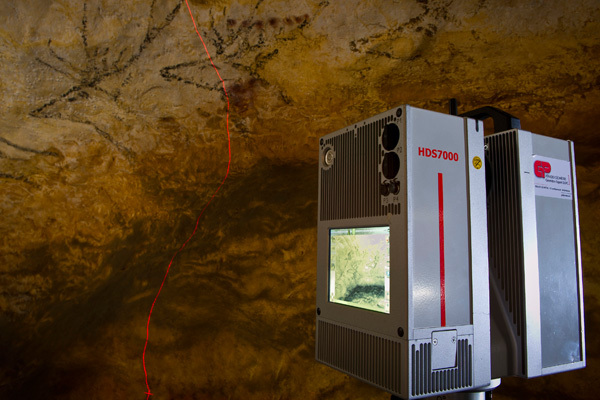 In digitally acquiring the undulating surface of the cave drawings through 3D laser scanning, we are left only with images that can be grafted onto mathematically precise points in virtual space. These points hold no depth and can be seen anywhere in the world, at any time with any digital device. The caves are now pure information. The thinness of the physical structures throughout the exhibition exemplify the ‘zero-dimensional’ quality of 3D models. Each physical object we encounter is derived from the original 3D model and pushes against its own architectural and structural limits in order to maintain this illusion of immateriality. The next room in the exhibit presents enormous, to-scale wall replicas of select rooms of the caves. Faux-stone surfaces with crude pigmented drawings tower over the viewer. They appear rocky, irregular and roughly an inch thick while being held from behind by large geometric structures (mirroring the display techniques holding the 1:10 scale models) Termed ‘stone-veils’, these massive replicas attempt to enter into this depth-less and perfect zone of the digital. Lights subtly change in this new space, revealing different perspectives of the drawings that are on the walls similar to how the faux-candles changed the surface in the animation. Two hyper-real sculptures of a man and woman clad in animal skins and jewelry peer out of the cracks of adjoining walls. The woman points her finger outward with a look of fear on her face while the male, much older in age, sits beside her with a passive expression. Their uncanny expressions, particularly that of the womanâ€™s, instills a feeling of trespassing and self-awareness within the viewer. Despite all attempts, eye contact with the ancient figures is impossible. They always look through you. The translation of the physical into the perfect digital and back again into the physical is tested in this part of the exhibition. In placing the figure physically into the 3D caves represented in the prior room, we physically enter into a world understood to be built from the virtual. The forms are fragmentary and stand in as samples for the entire structure. In bringing together these fragmented 1:1 replicas, the entirety of the cave is presented. In encountering these forms, the question as to whether or not the replica can carry more weight than the original is predominant. Would the replicas and the recreated 3D model shift in meaning or value if the interior structure of the original cave tragically collapsed in on itself and became forever lost? Would the 3D model, and the perfect reproductions that can be derived from it, function as the new original? Or, to speak to recent cultural apocalyptic fetishism, if the world should disappear would Google Earth be the perfect world before it beset an unfortunate event? The ancient cave drawings at Lascaux now digitally exist everywhere and at all times simultaneously, trapped photographically in the moment they were recorded. Visiting the original now seems fruitless and arbitrary. This possibility of representing the cave structure in virtual space results in a new consideration of aura. In becoming virtual, the caves are now equated with any digital model of any object and as a result now exist in historical ambiguity. A digital spoon, table, asteroid, CAT Scan, height-field map of a farm in Nebraska or the Lascaux Caves all share the potential to exist simultaneously with one another, and at any scale, in the digital terrain. The digital caves are now a pseudo-artifact that share a likeness with the function of the souvenir. The 3D model of the cave presents the possibility for an acute historical analysis of the markings on its surface by way of mimicking the lighting conditions, zooming into the surfaces and experiencing time inside of the virtual models.Â It also allows for them to be placed in any virtual situation as object, container or reference. The trans-historical preoccupation with the surface of objects is emphasized by these contemporary reproductions of the Lascaux caves. Created 20,000 years ago, these early articulations of physical reality on a flat picture plane have traversed through time to be embodied by our most recent iteration of representation. Whereas historically the placement of images on surfaces has been the dominant concern of art and aesthetics, we are now seeing a preoccupation with the pure surface able to exist anywhere and in any form. We can now experience the cave with more exactitude than we ever could in real life. 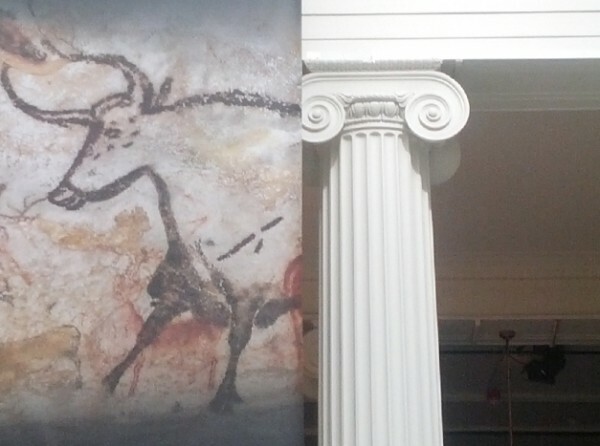 The Field Museum exhibit, “Scenes from the Stone Age: The Cave Paintings of Lascaux” closes on September 8th, 2013. Daniel G. Baird (b. 1984) received his BFA from the School of the ArtÂ Institute of Chicago and MFA from the University of Illinois,Â Chicago. Recent Solo exhibitions include ‘Vestige’ at the Institute of Jamais Vu, London, ‘Has the World Already Been Made? X4’ at both Roots and Culture, Chicago IL and Hedah, Maastricht, Netherlands, ‘Meridian’ at RobertÂ Bills Contemporary, Chicago, IL and ‘This New Ocean,’ at AppendixÂ Project Space, Portland OR. Recent Group exhibitions include BowlingÂ Alone, Andrew Rafacz Gallery, Merge Visible, Prairie Productions,Â Chicago, IL. He will present work at the Elizabeth Foundation, NY and Leeds College of Art in 2014.